The iconic Albert Sloman Library at the University of Essex has provided library services to students for almost fifty years. As the University underwent expansion plans, a significant extension to the library building was needed, expanding the Library by 30%. The extension will enable the University to house a collection of 1.4 million books and will provide additional study space for our students. Further to this, it was decided that a new three-storey Student Centre was also needed with an open-access 24-hour Learning Hub providing a technology-rich study space for creative and group working, new IT facilities including touchdown access, an IT helpdesk and a new state-of-the-art media centre for the Students’ Union (just to name a few!). An acoustic screen has been installed between the building site and the Library to act as a sound barrier. Specialist equipment was bought to reduce noise on-site, with all staff briefed on the importance of minimising noise. An acoustic partition has been installed in the Library reading room, providing screening for 200 workstations. The access route for contractors to get to the site was designed and revised to minimise disruption to students in our campus accommodation. Levels of building work will be reduced during revision and exam periods. Building work ceased during Graduation. 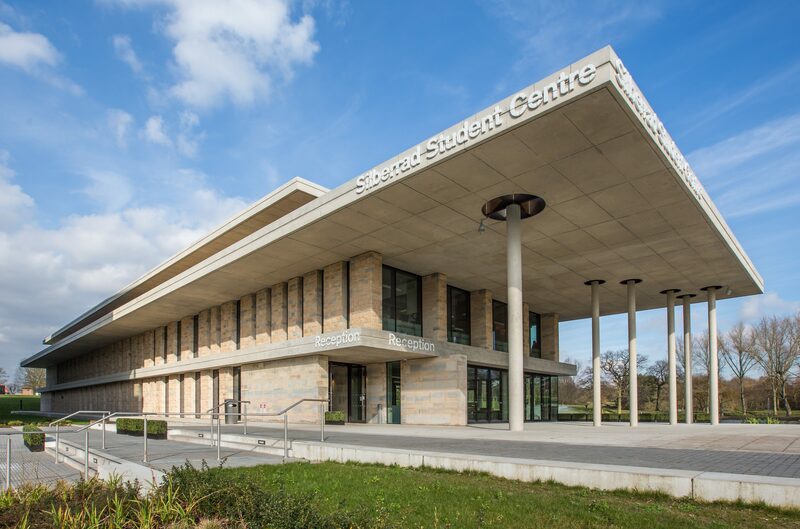 The Silberrad Student Centre is a multi-award winning project, scooping prestigious accolades for its design, construction and overall building efficiency. PMJ Masonry was pleased to receive a Highly Commended Certificate at the National Stone Federation Awards in London. We are very much looking forward to working on a similar project in the future.